To stop a program on your TI-84 Plus calculator while it is executing, press [ON]. You are then confronted with the ERROR: BREAK error message that gives you the option to QUIT the execution of the program. The control command Stop is added to a program when you want to terminate the program before it reaches the end. It is illustrated in the first two screens here. Placing the Stop command at the end of a program isn’t necessary. The program automatically terminates execution when it reaches the last command. When a program is executed, the output from the program is displayed quickly on the Home screen or in a graphing window. Sometimes it is necessary to pause the program so that the program user has time to view the results of a program output. The Pause command temporarily suspends the execution of a program so that the user can see the program output. The execution of the program is resumed when the program user presses [ENTER], as in the program in the second screen here. 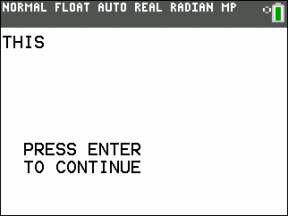 The program output appears in the following figure. The moving busy indicator in the upper-right corner tells the program user that the program is waiting for the user to press [ENTER] to resume execution of the program.